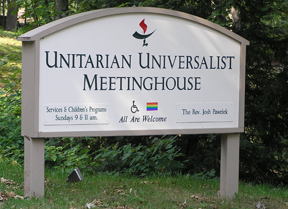 Unitarian Universalism is a caring, open-minded religion that encourages seekers to follow their own spiritual paths. Our faith draws on many religious sources, welcoming people with different beliefs. We are united by shared values, not by creed or dogma. If you’re wondering whether Unitarian Universalism fits in with your beliefs, you might try the Belief-o-matic quiz on a rather commercial website (try to ignore the advertising) Belief Quiz. Find links to the Unitarian Universalist Association to find out more on Unitarian Universalism here. Do you need a nametag or a welcome-to-Unitarian Universalist Society: East packet? If so, please stop at the welcome table in the foyer and speak to the greeter there, who will help you. We hope that you are receiving our monthly Unitarian Universalist Society: East newsletter via e-mail, which lists upcoming Sunday services, news about the Society, and the many activities at the meetinghouse. Fill out a visitor card at the welcome table and the church secretary will add you to our list to receive electronic communications from UUS:E. Not too many, we promise. Also, stop by the Newcomers Café during coffee hour. 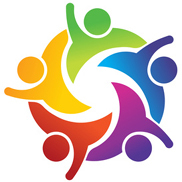 If you are interested in the Unitarian Universalist Society: East religious education program, click here for Religious Education for Children and Youth. You can also contact Jennifer Klee, membership chair, at jenduv@sbcglobal.net or 860-875-1285 with any questions you have about UUS:E.
Visitors are invited to meet Rev. Josh for a brief overview of UUS:E, followed by a tour of the building and grounds. Meet in his office after each service. No RSVP required. Join us for coffee and dessert on occasional Fridays, 7:00-8:30 p.m. Newcomers, new members, and those who want to meet new people, are invited to a friendly evening of coffee, dessert, and socializing at one of our member’s home. Bring a short reading or poem to share with the group. Plan for a few relaxed moments at the end of your week. Info & RSVP: uuseoffice@uuse.org. Due to logistical constraints, this event is for adults only. P.S. The reading doesn’t have to be religious or even serious; maybe something you’re reading at the moment or a favorite quote or song lyric. Rev. Josh and the Membership Committee present a lively and informative three-to-four-hour seminar about Unitarian Universalism and Unitarian Universalist Society: East. It’s a great way to learn more and is required if you choose to become a member. Please RSVP to Annie Gentile in the UUS:E office at 860-646-5151. Contact Jennifer Klee with any questions. (jenduv@sbcglobal.net). Childcare is available upon request. We will have a ceremony to welcome new members twice a year. RSVP to Annie Gentile in the UUS:E office at 860-646-5151 or uuseoffice@uuse.org. Contact Jennifer Klee with any questions (jenduv@sbcglobal.net). If you cannot attend one of these services, you can “sign the book” at any time. Contact Rev. Josh to make arrangements. Childcare available upon request. Please phone the Unitarian Universalist Society: East office five days before to request. This program is for all new members of UUS:E (last three years) and it provides a chance to learn more about UUS:E, its ministry, programs, opportunities, and each other. Come share and learn together. Lunch will be served and childcare is available upon request. RSVP to Annie Gentile in the office at 860-646-5151. 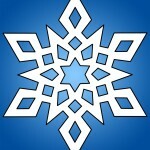 A brief history of Unitarian Universalist Society: East can be found here.